A few years ago, the New Orleans Post of Jewish War Veterans of America was regarded as the fastest-growing in the country. Now, with a name change, the Post is looking to expand its membership rolls further. A recruitment drive and unveiling of the new banner for Ben Katz Post 580 will take place on Nov. 13 at 10 a.m. at Shir Chadash in Metairie. The son of a Russian immigrant who was a kosher butcher, Katz was born in Erie, Pa., and briefly attended the University of Pennsylvania. During World War II he served in the U.S. Army Air Force, rising to the rank of sergeant. After basic training, he was assigned to Keesler Field in Biloxi, where he met his future wife, Miriam, at a USO dance where Jewish girls were brought in to meet the Jewish soldiers. “The rest of their story is classic ‘Biloxi Blues’,” said son Michael Katz. After the war they returned to Erie, then moved to New Orleans in 1960. In New Orleans, Katz became a charter member of the JWV Post, then became commander around 1985, when he was close to retiring. He also was regional commander. The Post that had been established with 85 charter members was down to just 13 paid members in 2009. Gothard led an effort to revitalize the Post, with many new members working to attract others. Today, the Post has 89 veterans as members, and 72 patrons. Jewish veterans of allied countries, especially Israel, are eligible for membership. Anyone can be a patron, and over 25 of the Post’s patrons aren’t Jewish — including a Kurd from Turkey. “We have or have had members that served in the armed forces of Israel, England, Poland, Ukraine and Russia,” Gothard said. The Post’s Color Guard has also participated in numerous community events, and the Post has held programs at most area congregations and was the only veteran’s group to march in the Martin Luther King Day Parade. “We are the sight and sound of Jewish Americans that have served and are now serving in the armed forces of the United States,” Gothard explained. The Post recently had a noteworthy event in the wedding of Kristin Pepper and Sgt. Jacob Ginsberg at the home of Susan and Harley Ginsberg in Metairie. 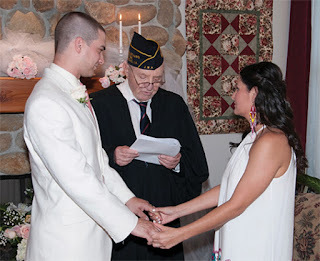 Gothard officiated the wedding while wearing his JWV Commander’s cap in Sgt. Ginsberg’s honor. “You make me and everyone else in this room today, proud and grateful to you for defending us,” Gothard said during the ceremony. In his 44 years as judge, Gothard has presided over numerous weddings, but this was the first time he had officiated for a member of the armed forces on active duty. Ginsberg joined the Post and his father joined as a patron. A New Orleans native, Ginsberg graduated from Tulane in 2012, then enlisted in the army, earning the occupational specialty of 15T: UH-60 Black Hawk Helicopter Maintainer. After being assigned to Fort Campbell, Ky., as part of the 101st Airborne Division, he had a nine-month deployment to Nangarhar Province in Afghanistan. Upon his return to the U.S., he was promoted and joined the most elite aviation unit, the 160th Special Operations Aviation Regiment. Pepper, also a New Orleans native, graduated from Jacksonville State University and the Loyola University Masters of Criminal Justice program. In Birmingham, JWV will host a talk on Nov. 6 by Dominique Linchet. A native of Belgium, Linchet is foreign language department chair at the Alabama School of Fine Arts and teaches an elective course in Holocaust studies. Through the Birmingham Holocaust Education Center she attended the Belfer Conference on Holocaust education in Washington, and is also an expert on the Battle of the Bulge. Her talk will be at 10 a.m. in the Levite Jewish Community Center board room. There will be a light brunch of coffee and bagels. The community at large is invited and one do not has to be a veteran to attend. Some members of the Birmingham JWV Post will participate in the annual Peace Luncheon and the Veteran’s Day Parade, which is the oldest in the nation, on Nov. 11. On Nov. 12, Veteran’s Day Shabbat will be observed at Birmingham’s Temple Beth-El during the 9:30 a.m. service. As with all Beth-El services, it will be livestreamed online. Buddy Bernstein and his daughter, Claire Coleman, will lead a Veteran’s Day Shabbat service on Nov. 11 at B’nai Israel in Florence, at 7 p.m. The JWV Ben Katz Post 580 in New Orleans will have a Veteran’s Day program at Shir Chadash in Metairie, co-sponsored by Beth Israel Congregation. The Nov. 13 program will feature “A Jewish Soldier in a Hostile War Zone” and “Jewish Defenders of Freedom Throughout the Ages,” with Major Carol Berman and Judge Sol Gothard. Minyan will be at 9:15 a.m., followed by the 10 a.m. program and continental breakfast. The Post’s color guard will present the colors, and veterans, Post members and active duty personnel are encouraged to wear uniforms, JWV caps or service caps. The community is invited. The annual Veterans Day Dinner at B’nai Israel in Pensacola is planned for Nov. 11 at 6 p.m. In previous years, the dinner was organized by Bill Allen, who died in June. His niece, Kate Lollar, is organizing this year’s dinner in his memory and hopes to keep it going in the future. The Fred Sklar JWV Post of Northwest Louisiana will place new flags at the graves of Jews in the Shreveport area who served in the military. There will also be a Shabbat service for Veterans Day with details to be announced.